Photo Courtesy of the United States Department of Agriculture. Photo by Scott Bauer. The first soybeans arrived in America in the early 1800s onboard a Chinese ship where they were used as ballast. U.S. farmers first began growing soybeans in the early 1800s. However, it was not until the 1940s, when war ravaged large portions of China’s soybean fields, that soybean farming really took off. 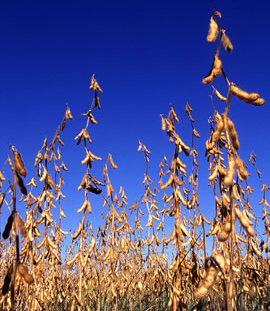 Soybeans were grown primarily as cattle feed. It is estimated that American poultry, beef, pigs, and dairy cattle eat about 22.5 million tons of soybeans annually. Currently, soybeans are grown in 29 states, and the U.S. is the largest grower of soybeans in the world, around 2 billion bushels a year. Soybeans are utilized in many different products such as tofu, candy, antibiotics, and soymilk. Click on PICTURES below to see a photo of a mature soybean plant. Click on CHARTS and MAPS below for additional facts about soybeans.